On December 15, 1987, entrepreneur Jerry Richardson announced his bid for an NFL expansion franchise in the Carolinas. A North Carolina native, Richardson was a former wide receiver on the Baltimore Colts who had used his 1959 league championship bonus to co-found the Hardee's restaurant chain, later becoming president and CEO of TW Services. Richardson drew his inspiration to pursue an NFL franchise from George Shinn, who had made a successful bid for an expansion National Basketball Association (NBA) team in Charlotte, the Charlotte Hornets. Richardson founded Richardson Sports, a partnership consisting of himself, his family, and a number of businessmen from North and South Carolina were also recruited to be limited partners. Richardson looked at four potential locations for a stadium, ultimately choosing uptown Charlotte. To highlight the demand for professional football in the Carolinas, Richardson Sports held preseason games around the area from 1989 to 1991. The first two games were held at Carter–Finley Stadium in Raleigh, North Carolina, and Kenan Memorial Stadium in Chapel Hill, North Carolina, while the third and final game was held at Williams-Brice Stadium in Columbia, South Carolina. The matchups were between existing NFL teams. 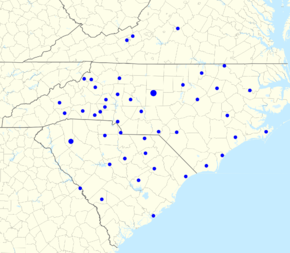 In 1991, the group formally filed an application for the open expansion spot, and on October 26, 1993, the 28 NFL owners unanimously named the Carolina Panthers as the 29th member of the NFL. The Panthers first competed in the 1995 NFL season; they were one of two expansion teams to begin play that year, the other being the Jacksonville Jaguars. The Panthers were put in the NFC West to increase the size of that division to five teams; there were already two other southeastern teams in the division, the Atlanta Falcons and the New Orleans Saints. Former Pittsburgh Steelers defensive coordinator Dom Capers was named the first head coach. The team finished its inaugural season 7–9, the best performance ever from a first-year expansion team. They performed even better in their second season, finishing with a 12–4 record and winning the NFC West division, as well as securing a first-round bye. The Panthers beat the defending Super Bowl champions Dallas Cowboys in the divisional round before losing the NFC Championship Game to the eventual Super Bowl champions, the Green Bay Packers. The team managed only a 7–9 finish in 1997 and slipped to 4–12 in 1998, leading to Capers' dismissal as head coach. The Panthers hired former San Francisco 49ers head coach George Seifert to replace Capers, and he led the team to an 8–8 record in 1999. The team finished 7–9 in 2000 and fell to 1–15 in 2001, winning their first game but losing their last 15. This performance tied the NFL record for most losses in a single season and it broke the record held by the winless 1976 Buccaneers for most consecutive losses in a single season (both records have since been broken by the 2008 Lions), leading the Panthers to fire Seifert. After the NFL's expansion to 32 teams in 2002, the Panthers were relocated from the NFC West to the newly created NFC South division. The Panthers' rivalries with the Falcons and Saints were maintained, and they would be joined by the Tampa Bay Buccaneers. New York Giants defensive coordinator John Fox was hired to replace Seifert and led the team to a 7–9 finish in 2002. Although the team's defense gave up very few yards, ranking the second-best in the NFL in yards conceded, they were hindered by an offense that ranked as the second-worst in the league in yards gained. The Panthers improved to 11–5 in the 2003 regular season, winning the NFC South and making it to Super Bowl XXXVIII before losing to the New England Patriots, 32–29, in what was immediately hailed by sportswriter Peter King as the "Greatest Super Bowl of all time". King felt the game "was a wonderful championship battle, full of everything that makes football dramatic, draining, enervating, maddening, fantastic, exciting" and praised, among other things, the unpredictability, coaching, and conclusion. The game is still viewed as one of the best Super Bowls of all time, and in the opinion of Charlotte-based NPR reporter Scott Jagow, the Panthers' Super Bowl appearance represented the arrival of Charlotte onto the national scene. Following a 1–7 start in 2004, the Panthers rebounded to win six of their last seven games despite losing 14 players for the season due to injury. They lost their last game to New Orleans, finishing the 2004 season at 7–9. Had they won the game, the Panthers would have made the playoffs. The team improved to 11–5 in 2005, finishing second in the division behind Tampa Bay and clinching a playoff berth as a wild-card. In the first round of the playoffs, the Panthers went on the road to face the New York Giants, beating them 23–0 for the NFL's first playoff shutout against a home team since 1980. The following week, they beat Chicago 29–21 on the road, but lost key players Julius Peppers, a defensive end, and DeShaun Foster, a running back, who were both injured during the game. The Panthers were then defeated 34–14 by the Seattle Seahawks in the NFC Championship Game, ending their season. Although the Panthers went into the 2006 season as favorites to win the NFC South, they finished with a disappointing 8–8 record. The team finished the 2007 season with a 7–9 record after losing quarterback Jake Delhomme early in the season due to an elbow injury. In 2008, the Panthers rebounded with a 12–4 regular season record, winning the NFC South and securing a first-round bye. They were eliminated in the divisional round of the playoffs, losing 33–13 to the eventual NFC Champion Arizona Cardinals after Delhomme turned the ball over six times. 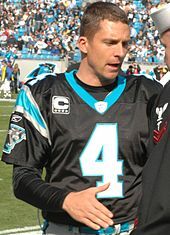 Delhomme's struggles carried over into the 2009 season, where he threw 18 interceptions in the first 11 games before breaking a finger in his throwing hand. The Panthers were at a 4–7 record before Delhomme's season-ending injury, and his backup, Matt Moore, led the team to a 4–1 finish to the season for an 8–8 overall record. In 2010, after releasing Delhomme in the offseason, the Panthers finished with a league-worst (2–14) record; their offense was the worst in the league. John Fox's contract expired after the season ended, and the team did not retain him or his staff. 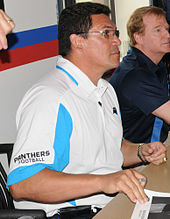 The team hired Ron Rivera to replace Fox as head coach and drafted Auburn's Heisman Trophy-winning quarterback Cam Newton with the first overall pick in the 2011 NFL Draft. The Panthers opened the 2011 season 2–6, but finished with a 6–10 record, and Newton was awarded the AP Offensive Rookie of the Year award after setting the NFL record for most rushing touchdowns from a quarterback (14) in a single season and becoming the first rookie NFL quarterback to throw for over 4,000 yards in a single season. He also was the first rookie quarterback to rush for over 500 yards in a single season. In 2012, the Panthers again opened the season poorly, losing five out of their first six games, leading longtime general manager Marty Hurney to be fired in response. The team slid to a 2–8 record before winning five of their last six games, resulting in a 7–9 record. This strong finish helped save Rivera's job. The Panthers had a winning season the following year, finishing with a 12–4 record and winning their third NFC South title and another playoff bye, but they were beaten by the 49ers in the Divisional Round. In 2014, the Panthers opened the season with two wins, but after 12 games sat at 3–8–1 due in part to a seven-game winless streak. A four-game winning streak to end the season secured the team their second consecutive NFC South championship and playoff berth, despite a losing record of 7–8–1. The Panthers defeated the Arizona Cardinals, 27–16, in the wild card round to advance to the divisional playoffs, where they lost to eventual NFC champion Seattle, 31–17. The 2015 season saw the Panthers start the season 14–0 and finish the season 15–1, which tied for the best regular-season record in NFC history. The Panthers also secured their third consecutive NFC South championship, as well as their first overall top-seeded playoff berth. In the 2015–16 playoffs, the Panthers defeated the Seattle Seahawks in the NFC Divisional playoffs, 31–24, after shutting them out in the first half, 31–0, and the Arizona Cardinals, 49–15, in the NFC Championship Game to advance to Super Bowl 50, their first Super Bowl appearance since the 2003 season. The Panthers lost a defensive struggle to the AFC champion Denver Broncos, 24–10. On May 16, 2018, David Tepper, formerly a minority owner of the Pittsburgh Steelers, finalized an agreement to purchase the Panthers. The sale price was nearly $2.3 billion, a record. The agreement was approved by the league owners on May 22, 2018. The sale officially closed on July 9, 2018. After starting 6-2, the Panthers finished the 2018 season 7-9. The shape of the Panthers logo was designed to mimic the outline of both North Carolina and South Carolina. The Panthers changed their logo and logotype in 2012, the first such change in team history. According to the team, the changes were designed to give their logo an "aggressive, contemporary look" as well to give it a more three-dimensional feel. The primary tweaks were made in the eye and mouth, where the features, particularly the muscular brow and fangs, are more pronounced, creating a more menacing look. The revised logo has a darker shade of blue over the black logo, compared to the old design, which had teal on top of black. The team's uniform has remained largely the same since its creation, with only minor alterations such as changing the sock color of the team's black uniforms from blue to black and changing the team's shoes from white to black. Richardson, a self-described traditionalist, said that no major uniform changes would be made in his lifetime. The Panthers have three main jersey colors: black, white, and blue. Their blue jerseys, designated their alternate uniforms, are the newest and were introduced in 2002. NFL regulations allow the team to use the blue jersey up to two times in any given season. In all other games, the team must wear either their white or black jerseys; in NFL games, the home team decides whether to wear a dark or white jersey, while the away team wears the opposite. Usually the Panthers opt for white or blue when the weather is expected to be hot and for black when the weather is expected to be cold. The Panthers typically pair their white jerseys with white pants, while the black and blue jerseys are paired with silver pants; there have only been a few exceptions to these combinations. The first such instance was in 1998, when the team paired their white jerseys with silver pants in a game against the Indianapolis Colts. The second instance was in 2012 during a game against the Denver Broncos, when they paired their black jerseys with new black pants; this created an all-black uniform, with the exception of blue socks and silver helmets. The decision to wear blue socks was made by team captain Steve Smith, who felt the blue socks gave the uniforms a more distinct appearance compared with other teams that have all-black uniforms. The all-black uniforms won the "Greatest Uniform in NFL History" contest, a fan-voted contest run by NFL.com in July 2013. In July 2013, the team's equipment manager, Jackie Miles, said the Panthers intended to use the all-black uniform more in the future. The Panthers wore the all-black uniform three times the following season, once each in the preseason and regular season, and the third time during the home divisional round playoff game vs the 49ers. During the Panthers' 2015 Thanksgiving Day game against the Dallas Cowboys, they debuted an all-blue uniform as part of Nike's "Color Rush" series. The Panthers played their first season at Memorial Stadium in Clemson, South Carolina, as their facility in uptown Charlotte was still under construction. Ericsson Stadium, called Bank of America Stadium since 2004, opened in the summer of 1996. Bank of America Stadium is owned entirely by the Panthers, making them one of the few teams in the NFL to own the facility they play in. 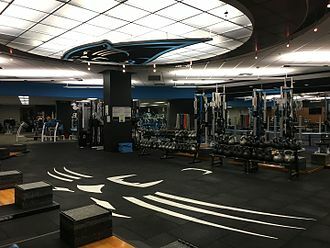 The stadium was specially designed by HOK Sports Facilities Group for football and also serves as the headquarters and administrative offices of the Panthers. On some days the stadium offers public tours for a fee. Private tours for groups are offered for a fee seven days a week, though there are some exceptions, and such tours must be arranged in advance. Two bronze panther statues flank each of the stadium's three main entrances; they are the largest sculptures ever commissioned in the United States. The names of the team's original PSL owners are engraved on the base of each statue. The two people in the Panthers Hall of Honor, team executive Mike McCormack and linebacker Sam Mills, are honored with life-sized bronze statues outside the stadium. Mills, in addition to being the only player in the Hall of Honor, is the only player to have had his jersey number (#51) retired by the Panthers as of 2016[update]. The Panthers have three open-air fields next to Bank of America Stadium where they currently hold their practices; during the 1995 season, when the team played their home games in South Carolina, the team held their practices at Winthrop University in Rock Hill, South Carolina. Because the practice fields, along with the stadium, are located in uptown Charlotte, the fields are directly visible from skyscrapers as well as from a four-story condominium located across the street. According to Mike Cranston, a running joke said that the Panthers' division rivals had pooled their resources to purchase a room on the building's top floor, and that a fire at the condominium was caused by the Panthers organization. In order to prevent people from seeing inside the field while the team is practicing, the team has added "strategically planted trees and a tarp over the ... fence surrounding the fields". Additionally, they employ a security team to watch for and chase away any people who stop alongside the fence surrounding the field. In the event of bad weather, the team moves their practices to an indoor sports facility about 10 miles from the stadium. The team does not own this facility. The Panthers have hosted their annual training camp at Wofford College in Spartanburg, South Carolina, since 1995. 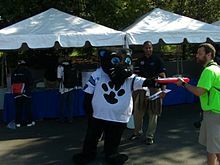 The Panthers are supported in both North Carolina and South Carolina; South Carolina Governor Nikki Haley declared July 30, 2012, "Carolina Panthers Day" in her state, saying that "when it comes to professional teams, the Carolina Panthers are the team that South Carolina calls their own". During the 2016 NFC Championship and Super Bowl, the hashtag #OneCarolina was used by college and professional sports teams from North Carolina and South Carolina to show unified support for the Panthers. Pat Yasinskas of ESPN.com observed that while there is "a bit of a wine-and-cheese atmosphere at Panthers games ... there is a strong core of die-hard fans who bring energy to Bank of America Stadium. Charlotte lives and dies with the Panthers because there aren't a lot of other options in the sports world". Sports Illustrated graded the Panthers as having the 10th highest "NFL Fan Value Experience" in 2007, attributing much of the fan atmosphere to the team's newness when compared to the established basketball fanbase. They also observed that the stadium has scattered parking lots, each of which has a different tailgating style. Some have fried chicken, pork, or Carolina-style barbecue, while others have live bands and televisions. Pickup football games in the parking lots are common, but fans tend to "behave themselves", in part due to blue laws that prevent the sale of alcohol before noon on Sundays. 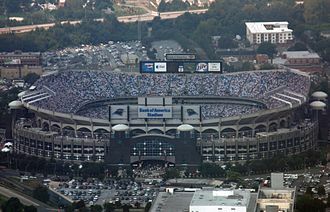 The Carolina Panthers have sold out all home games since December 2002, and their home attendance has ranked in the NFL's top ten since 2006. Starting with the 2012 season, the Panthers introduced the Keep Pounding Drum, inspired by the aforementioned motivational speech by Sam Mills before the team's 2004 playoff game against the Cowboys. Prior to each home game, an honorary drummer hits the six-foot tall drum four times to signify the four quarters of an American football game. According to the team, the drummers "come from a variety of backgrounds and occupations, but all have overcome a great trial or adversity that has not only made them strong but also pushes them to make others around them stronger". Drummers have included current and former Panthers players, military veterans, Make-A-Wish children, and athletes from other sports, including NBA MVP and Charlotte native Stephen Curry, US women's national soccer team players Whitney Engen and Heather O'Reilly, and 7 time NASCAR Cup Series champion Jimmie Johnson. During the inaugural season of the Panthers, the team had an official fight song, which the team played before each home game. The song, "Stand and Cheer", remains the team's official fight song, but the team does not typically play it before home games. Due to negative fan reaction "Stand and Cheer" was pulled in 1999. Since 2006, the song has returned. The team plays Neil Diamond's "Sweet Caroline" after home victories. A "keep pounding" chant was introduced during the 2015 season which starts before the opening kickoff of each home game. As prompted by the video boards, one side of the stadium shouts "keep" and the other side replies with "pounding". The chant is similar to ones that take place at college football games. Radio coverage is provided by flagship station WBT (1110 AM) and through the Carolina Panthers Radio Network, with affiliates throughout the Carolinas, Georgia, and Virginia. The Panthers' radio broadcasting team is led by play-by-play voice Mick Mixon, with Eugene Robinson as color analyst, and WBT sports director Jim Szoke as studio host. The radio network broadcasts pre-game coverage, games with commentary, and post-game wrap-ups. It also live-broadcasts Panther Talk, a weekly event at Bank of America Stadium which offers fans a chance to meet a player and ask questions of the staff. All preseason games and team specials are televised by the Carolina Panthers Television Network on flagship station WSOC-TV in Charlotte and fourteen affiliate stations throughout the Carolinas, Georgia, Virginia, and Tennessee. WSOC took over as the Panthers' television partner for the 2019 season, replacing longtime television partner WCCB, which had retained this role after losing the Fox affiliation to WJZY in 2013. The television broadcasting team consists of play-by-play commentator Mike Morgan, color analyst and former Panthers player Mike Rucker, and sideline reporter Pete Yanity. The network also hosts The Panthers Huddle, a weekly show focusing on the Panthers' upcoming opponent. Panthers Gameday, the Panthers' postgame show, is hosted by sports anchor Russ Owens and former Panthers lineman Kevin Donnalley on WCNC-TV. The Panthers also offer game broadcasts in Spanish on an eight-station network fronted by WGSP-FM in Pageland, South Carolina, as well as additional radio affiliates in Mexico. Jaime Moreno provides the play-by-play while his nephew, Luis Moreno Jr., is the color commentator. They have become popular even among English-speaking Panther fans for their high-energy, colorful announcing style. The Panthers have developed heated rivalries with the three fellow members of the NFC South (the Atlanta Falcons, Tampa Bay Buccaneers, and New Orleans Saints). The team's fiercest rivals are the Falcons and Buccaneers. The Falcons are a natural geographic rival for the Panthers, as Atlanta is only 230 miles (370 kilometers) south on I-85. The two teams have played each other twice a year since the Panthers' inception, and games between the two teams feature large contingents of Panthers fans at Atlanta's Mercedes-Benz Stadium and large contingents of Falcons fans at Bank of America Stadium. The Panthers' rivalry with Tampa Bay has been described as the most intense in the NFC South. The rivalry originated in 2002 with the formation of the NFC South, but became particularly heated before the 2003 season with verbal bouts between players on the two teams. It escalated further when the Panthers went to Tampa Bay and beat them in what ESPN.com writer Pat Yasinskas described as "one of the most physical contests in recent memory". The rivalry has resulted in a number of severe injuries for players on both teams, some of which were caused by foul play. One of these plays, an illegal hit on Tampa Bay punt returner Clifton Smith, sparked a brief melee between the teams in 2009. During their time in the NFC West, the Panthers began developing a rivalry with the San Francisco 49ers. This rivalry faded after the NFL moved the Panthers out of the NFC West. A relatively new rivalry, this one dates to the 2005 NFC Championship Game, in which the Seahawks won the game 31–14. The rivalry started up again in 2012, when the Panthers lost a close regular season home game to a Seattle Seahawks team led by rookie quarterback Russell Wilson, 16–12. In the 2013 season, the Panthers opened the season at home versus Seattle. They again lost a close game, with the final score 12–7. The Seahawks would go on to win Super Bowl XLVIII. In the 2014 season, once more at Bank of America Stadium, the Seahawks defeated the Panthers in week eight, 13–9. In the divisional round of the playoffs, the Panthers faced Seattle in Seattle, notorious for being a tough opposing field to play in, and lost 31–17. The Seahawks would go on to lose Super Bowl XLIX. In the 2015 season the next year, the teams faced off in Seattle, where the Panthers won another close game, 27–23. In the divisional round of the playoffs, the Panthers faced Seattle at Bank of America stadium, where they had yet to beat a Russell Wilson-led Seahawks team. By halftime they led 31–0, but the Seahawks rebounded and scored 24 unanswered points before the Panthers were able to seal the victory, 31–24. The Panthers would go on to lose Super Bowl 50. In the 2016 season, the teams met in Seattle, where the Panthers were beaten, 40–7. The teams did not face each other during the 2017 season. In the 2018 season, the Panthers were defeated by the Seahawks at home by a score of 30–27. Since the 2012 season, Carolina is 2–6 overall against Seattle and 1–1 in the playoffs. The rivalry aspect stems from how close the majority of the matches have been and the fact that they have played each other eight times between 2012 and 2018—at least once a year. The Carolina Panthers Hall of Honor was established in 1997 to honor individuals for their contributions to the Carolina Panthers organization. Each inductee is honored with a life-sized bronze statue outside of Bank of America Stadium's North Entrance, while the names of each original PSL owner are written on the black granite base at each of the six panther statues. A rule added in the mid-2000s by the Panthers organization requires all potential inductees to be retired for at least five years before they are eligible for induction. Nominees for the Pro Football Hall of Fame, which "honor[s] individuals who have made outstanding contributions to professional football", are determined by a 46-member selection committee. At least 80% of voters must approve the nominee for him to be inducted. Jerry Richardson was the founder and original owner of the Carolina Panthers. Richardson and his family owned about 48% of the team,[A] with the remaining 52% owned by a group of 14 limited partners. 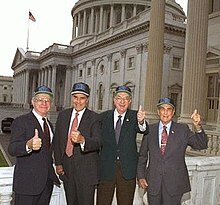 Richardson and the other investors paid $206 million for the rights to start the team in 1993. Mike McCormack, a Hall of Fame lineman for the Cleveland Browns and former coach and executive for the Seattle Seahawks, was the Panthers' first team president, presiding in that role from 1994 until his retirement in 1997; McCormack was inducted as the first person in the Carolina Panthers Hall of Honor later that year. Jerry Richardson's son, Mark, was appointed as the team's second president in 1997 and served in that role until he stepped down in 2009. His brother Jon, who had been president of Bank of America Stadium, stepped down at the same time. The resignations of Mark and Jon Richardson were unexpected, as it was thought that the two would eventually take over the team from their father. Mark Richardson was replaced by Danny Morrison, who had previously served as the athletic director of both Texas Christian University and Wofford College, Richardson's alma mater. On May 16, 2018, David Tepper, formerly a minority owner of the Pittsburgh Steelers, finalized an agreement to purchase the Carolina Panthers, for nearly $2.3 billion, a record at the time. The agreement was approved by the league owners on May 22, 2018. According to Forbes, the Panthers are worth approximately $2.3 billion as of 2018[update]. They ranked the Carolina Panthers as the 21st-most valuable NFL team and the 36th-most valuable sports team in the world. The Carolina Panthers have had four head coaches. Dom Capers was the head coach from 1995 to 1998 and led the team to one playoff appearance. Counting playoff games, he finished with a record of 31–35 (.470). George Seifert coached the team from 1999 to 2001, recording 16 wins and 32 losses (.333); he is the only head coach in team history not to have led the team to a playoff appearance. John Fox, the team's longest-tenured head coach, led the team from 2002 to 2010 and coached the team to three playoff appearances including Super Bowl XXXVIII which the Panthers lost. Including playoff games, Fox ended his tenure with a 78–74 (.513) record, making him the only Panthers coach to finish his tenure with the team with a winning record. Ron Rivera, the team's current head coach, has held the position since 2011 and has led the team to three playoff appearances including Super Bowl 50 which the Panthers also lost. Counting playoff games, he has a career record of 67–51–1 (.567). Statistically, Rivera has the highest winning percentage of any Panthers head coach. Since they began playing football in 1995, the Panthers have been to four NFC Championship Games; they lost two (1996 and 2005) and won two (2003 and 2015). The Panthers have won six division championships: the NFC West championship in 1996 and the NFC South championship in 2003, 2008, 2013, 2014, and 2015. They are the first and only team to win the NFC South back to back and have won the NFC South more times than any other team in the division. They have finished as runners-up in their division six times, finishing second-place in the NFC West in 1997 and 1999 and finishing second-place in the NFC South in 2005, 2006, 2007, and 2012. They have qualified for the playoffs 8 times, most recently in 2017. Kicker John Kasay is the team's career points leader. Kasay scored 1,482 points during his 16 seasons (1995–2010) with the Panthers. Quarterback Cam Newton, who has played for the Panthers since 2011, is the career passing leader, having thrown for 20,257 yards over his six seasons with the team. Running back Jonathan Stewart is the career rushing leader for the Carolina Panthers. Stewart, during his tenure with the team (2008–2018), rushed for 6,868 yards with the Panthers. Wide receiver Steve Smith, the team's leading receiver, recorded 12,197 receiving yards during his 13-year (2001–2013) tenure with the team. ^ Under NFL rules, an NFL owner and his family only need to control 30 percent of a team to be considered the team's controlling owner.